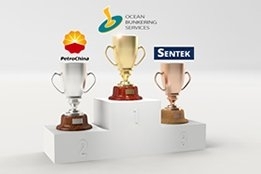 Ocean Bunkering Services (PTE) Ltd, the bunkering arm of the Hin Leong Group, has taken the title of Singapore's biggest bunker supplier by volume for 2018, according to the latest data released today by Maritime and Port Authority of Singapore (MPA). The supplier was ranked just 31st in 2016 and 8th last year. The world's biggest bunkering port sees Petrochina stay in the number two spot for a second successive year, having been ranked 12th in 2016. Sentek, ranked top in 2017 and second in 2016, slips to third place. Equatorial continued their steady rise up the rankings, for 2018 placed 4th, up from 5th in 2017 and 7th in 2016, while Shell rounded out the top five after slipping back from 4th for 2017. Maersk Oil Trading (MOT) made the largest positive move, gaining 18 places to become the 9th largest supplier for 2018, having ranked 27th on last year's list. Sinanju is another supplier making a notable climb up the rankings. Ranked 43rd in 2016 and 28th in 2017, for 2018 the firm climbed 15 places to 13th. Chemoil, now operating under Glencore Singapore PTE Ltd, after being ranked as the top supplier for 2015 and 2016 and 3rd for 2017, this year has the dubious honour of being the biggest negative mover by sinking 18 places to 21st. Another former powerhouse making its way down the list this year is BP. After dominating Singpaore with 11 straight years at the top through 2014, the supplier slipped to 2nd in 2015, 5th in 2016, 7th in 2017, and now down to 10th for 2018. Brightoil, despite its troubles late in the year including its entire six-strong fleet of bunker tankers being placed under arrest in November, ranked 28th having been placed 17th in 2017. Bomin (ranked 15th in 2017) and Aegean (ranked 20th in 2017) were the standout names not on this year's list having decided to exit the Singapore market in 2018. Singapore is by far the world's biggest bunker market by volume, seeing sales of almost 50 million mt of product in 2018. There are currently 51 licenced bunker suppliers operating in the port.